Quality is our identity and our key strength. In the two decades of our wholesale business, we have end-to-end experience in high volumes, about 15 to 10 tonnes of all products. We wish to carry forward the high standards and goodwill of our wholesale business to the online store. We believe our dry fruits and nuts online store is an excellent mode to ensure that only the best quality reaches you, at an excellent price. Our products are sourced from the best of the best – we import cashews from Mozambique (Africa), Mamra Almonds from Iran, and so on. We also cater to retailers across the country. In order to maintain high quality, we follow stringent processes for selecting and procuring the best dry fruits and nuts. Once we receive such hand-picked dry fruits and nuts, we clean, sort and package them manually at our state-of-the-art facility. 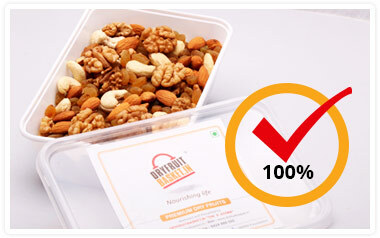 This ensures that only the freshest and highest quality of dry fruits and nuts are shipped to you. We have warehouse of 2000 sq. ft. for manual cleaning, sorting and packaging of dry fruits and nuts. After packaging, they are preserved in the cold storage. We adhere to the norms laid down by the Food Safety and Standards Authority of India (FSSI), including hand gloves and hair caps at our facility, to maintain the hygiene and cleanliness of the dry fruits and nuts.